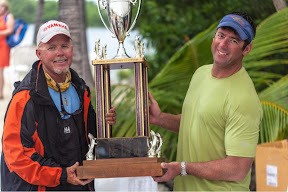 I've been meaning to put up a post highlighting some of the reason tournament action from the Florida Keys. In June, the Gold Cup Tarpon Tournament was won by Steve Ward and Captain Rick Murphy with a total of two weight fish (must be 70 lbs or greater) and nine releases. Second place went to Carlos Duncan guided by Captain Rob Fordyce with two weight fish and three releases. This tournament, now in its 49th year, is legendary with past winners like Ted Williams, five time winners Andy Mill and Glenn Flutie and winners like Sandy Moret and Billy Pate. It also shows you how tough tarpon fishing can be with two weight catches for first and second place. Capt. Murphy and Steve Ward hoist the trophy. Last week the Del Brown Permit Tournament was held in Key West, Fl and was won by Tony Nobregas guided by Captain Rob Fordyce. 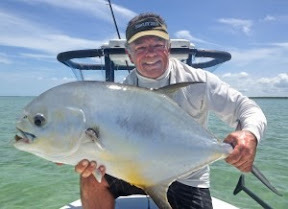 The two caught and releases two permit including the big fish which measured 44.5 inches. Tony Nobregas. That permit is a real beaut'. Del Brown is credited with ushering in the modern era of permit fishing with a fly rod having landed 513 on the long rod.